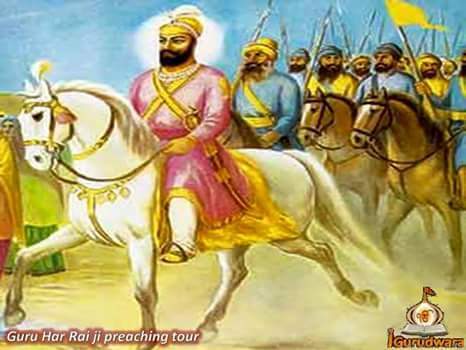 Did you know that GURU HAR RAI ji did lots of tours to spread Guru Arjan Dev ji’s teaching. Please read Sakhi below to know more about his tour. Guru Arjan Dev ji had practically completed the organization of his followers on peaceful lines and under Guru Har Gobindji, Sikhism had added into itself an army. Separately from placing importance on the free kitchen(Guru ka langar) and religious gathering and faith in the Adi Granth, Guru Har Rai ji undertook extensive tours in Malwa and Doaba regions of the Punjab. These regions provided good opportunities for the Sikh faith to develop. Guru Har Raiji made some notable changes among the landed families of the Punjab who were, at that time, considered the natural leaders of the people. On one of the Guruji’s tours, he stayed at Mukandpur in the present district of Jalandhar. There he drove a bamboo shoot into the ground in memory of his visit; and it still survives as a stately tree. From there he went to Malwa and visited the tank near Nathana where Guru Har Gobindji had fought. Kala and Karm Chand, two brothers of Maharaja tribe, came to him to complain that the people of Kaura tribe did not allow them to live among them. The Guruji tried to settle the matter kindly but when Kaura tribe refused to listen, he helped the Maharaja Brothers to take forcible possession of a piece of land and settle there. He remained for some time at Nathana preaching to the people, and Kala and his friends frequently waited on him. He made many disciples. His listeners did stoped the worship of graveyards and included the simple worship of God.